Missionaries of Charity Sisters in India, the order founded by Mother Teresa, are withdrawing from adoption work over fears that single gay and lesbian folks might welcome a child into their homes. Appealing to India’s Central Adoption Resource Authority, the Missionaries have “sought de-recognition” of 13 of their 16 orphanages in the country, reported The Huffington Post. In an interview with The Independent , Sister Amala said that children “may not receive real love” if they are not placed with a heterosexual couple. The Times of India reported two incidents where Missionaries rejected single parents already, though whether it was due to their sexual orientations is unclear. The new guidelines, aimed at increasing transparency, do eliminate the Missionaries ability to discriminate at will against LGBT people and others seeking to provide a loving home for children. The sisters also object to the fact prospective adoptive parents will be able to choose from one of six children, rather than being assigned by the Missionaries themselves. 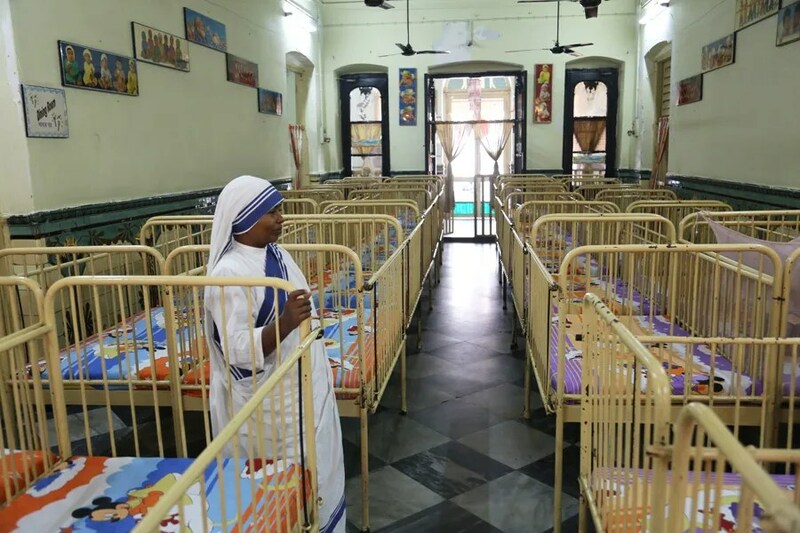 While adoptions by the Missionaries of Charity have ceased, Women and Child Development Minister Maneka Gandhi is hopeful that because “they are good people,” the sisters can be persuaded to reverse their decision, reported National Public Radio. “In New Delhi, [the Missionaries of Charity] has transferred six unadopted children to Holy Cross Social Services, a Catholic organization. . . The question is a good one given that India has an estimated 30 million children who have been orphaned or abandoned, according to The Washington Post. This is the highest number in the world and india’s adoption system is woefully inadequate at the moment with only 0.4% of such children being adopted. “This is a retrogressive and harmful mindset, given the fact that many potential parents who wish to adopt children may not be able to fit the rigorous moral conditions of the Missionaries. And why on earth would a person’s sexual orientation be tantamount to a risk to the child? It is no one’s case that strict background checks not be conducted on prospective parents. . . The Missionaries of Charity’s decision seems particularly punitive given the state of sexual rights in India, which not only still bans adoption by lesbian and gay people but also re-criminalized homosexuality in 2013, a decision that was actually criticized by Catholic leaders. “For gay people wanting to raise children, MoC’s argument can be exploited by right-wing groups looking to strip LGBT persons of their (already negligible) rights. The organisation has sought to frame its argument as a necessity for the protection of to-be-adopted children, and has thus played into vicious stereotypes that portray gays as incapable of being responsible adults, or worse, pedophiles. . . Indeed, if 30 million children lack loving homes and LGBT people are willing to provide them loving homes, it is eminently reasonable for these adoptions to be facilitated by the Indian government and Catholic organizations alike. Not facilitating these adoptions may adhere to the letter of the law of Mother Teresa’s ministry, but deviate from the spirit of her work. Though she was negative about lesbian and gay people, preferring to call them “friends of Jesus” rather than acknowledging their sexual orientation, the Missionaries under her leadership have set up AIDS hospices. To not participate in Indian adoptions is not only discrimination and a deep injustice against LGBT, single, and divorced people, but is the act which actually denies children the security, moral upbringing, and real love the Missionaries profess. The Missionaries of Charity should look beyond a harmful legalism and dated prejudices to embrace instead Christ’s expansive love and accompany all those on the margins whom God loves most. That would be a real act of charity. Just goes to show us that saints are blind too. Mother Teresa saw and responded to the glaring needs of the poorest of the poor children. She couldn’t do more than she did. She is blessed, even though she had tunnel vision, that only allowed her to see one suffering, not all suffering. She was blind to the truth about lgbt people. Her dedication to single minded service is an example of how to perservere and do mighty works. We too shall perservere. We too are blessed. Jesus wept . . . This news is so horrific — and I would even say so ANTI-CHRISTIAN in its import and impact — that it is simply off the charts. It’s no exaggeration to say that Mother Teresa was held in much higher regard by the Catholic population at large than certain recent Popes were held — let alone the public’s opinion of certain socially retrograde bishops like Chaput and Cordileone. To see such a virulent and corrosive homophobia attributed to her is just literally heartbreaking — if indeed it is true. She is no longer available to speak for herself. But what do our other contributors make of this news item? I guess they really are a Cult, rather than a religious Order, as Sr. Rose told me after working with them in India for a year. They refused to “fellowship” with us, after they found out we were Old Catholics. We supplied them with Thousands of Dollars of Medication for their TJ Clinic. They couldn’t even say “Thanks You”, or look us in the face! Guess their mentality comes from their 18th. Cent. Mentality and practices. It is so much easier to hate, than to follow Jesus’ mandate to love.